Property Size 640 sq. ft. They are very friendly, easy to work with. Answers ant question you my have immediately. The condo was as it looked in the pictures. Well equipped kitchen, brand new appliances that were delivered the day of our arrival, we were kept informed of the delivery., didnt impact us at all. Very friendly people to work with and very helpful with questions, response to text immediately. Would definitely stay at this condo again. "My most favorite sight is when 59S ends at Beach Blvd. When we get to that red light and see the Gulf, we all still get a little giddy. I love drinking coffee on the balcony as the sun rises and everything is quiet, except for the surf. I love the dining, especially in the Fall. No wait, no stress, and excellent seafood. Really, I like it all, but we like Fall on the Gulf Coast." "Easy pace. Good value. Good food. Great golf. Beautiful beaches and sunsets. 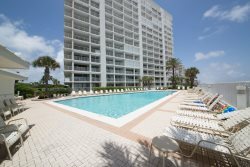 Traffic not near the hassle of Destin."